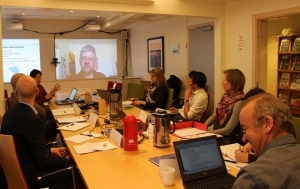 The European Marine Board Communication Panel (EMBCP) provides a pan-European platform for marine science communicators to promote Marine Board activities, to synergize outreach activities and to advocate ocean literacy. Popularize marine science by advocating more Ocean Literacy. The panel participates in conferences and events, to promote the importance of communication and ocean literacy. The MBCP supported the communication of EurOCEAN 2010 and 2007. The panel also organized sessions at events such as European Geosciences Union General Assembly (EGU) 2009, EuroScience Open Forum (ESOF) 2008, a joint session on Ocean Literacy at the ESOF 2012, First Conference on Ocean Literacy in Europe (2012) and 1st and 2nd International Marine Science Communication Conference (IMSCC 2014 and CommOCEAN2016). Next meeting: The next EMBCP meeting will take place on 3-4 May 2017 in Genoa, Italy. On 6 and 7 December 2016, the European Marine Board and its Communication Panel, the IODE Project Office for IOC/UNESCO and the Flanders Marine Institute organised the CommOCEAN2016 conference on marine science communication. The conference (in Bruges, Belgium) was aimed at marine scientists and communicators. The program promoted the exchange of good practice in modern ocean science communication, dissemination and outreach, as well as learning about current marine science research. The conference programme comprised four major sessions: the fundamentals of science communication/reaching out to the public; optimizing impact; social media & graphics and; thinking out of the box, new formats & creativity. In addition, on 8 December an Ocean Teacher training course on ocean communication was organized by the IODE Project Office for IOC of UNESCO in Ostend for 50 people. Materials from the conference can be found on the dedicated conference website. You can also follow the discussions via Twitter (@CommOCEAN2016). The 1st International Marine Science Communication Conference (IMSCC 2014, 8-9 September, Porto) focused on tools and practices for scientists and marine science communicators to develop their skills and improve dialogue with a range of target audiences including the general public and decision-makers. The concept of a conference dedicated to marine science communication was first proposed by the EMBCP and the conference was jointly organized by CIIMAR (Interdisciplinary Centre of Marine and Environmental Research of the University of Porto), the EMBCP and Ciência Viva (Portuguese National Agency for Scientific and Technological Culture). Presentations and workshops covered a broad spectrum of marine science communication issues including the use of tools such as social media and infographics, tips for dealing with the media and case studies of successful outreach programmes employing best practice. The MBCP co-organized the First Conference on Ocean Literacy in Europe in Bruges, Belgium on 12 October 2012. The conference was attended by 110 participants from 15 countries. The programme included high-profile speakers from European and international organizations with a strong interest in ocean education and marine science communication, including Wendy Watson-Wright, Executive Secretary of the Intergovernmental Oceanographic Commission and Assistant Director-General of UNESCO and Waddah Saab of the European Commission DG Research and Innovation. This event highlighted a crucial need for public support towards achieving a sustainable maritime economy and knowledge-based society. Further information on the conference as well as its outcomes and proposed actions here. The MBCP organized a workshop “Atlantic Ocean Literacy : a Grand Challenge for Marine Science Communication and Education” during the Euroscience Open Forum (ESOF) 2012 in Dublin, on 12 July 2012. The session was coordinated by Albert Gerdes (MBCP/MARUM, Germany), speakers: Jan Seys (MBCP/VLIZ, Belgium), Evy Copejans (EMSEA/VLIZ, Belgium), Ana Norona (Ciencia Viva, Portugal) and Peter Tuddenham (College of Exploration, USA). This event, bringing together European and North American experts in marine science communication and education, delivered valuable recommendations for future trans-Atlantic cooperation in the area of Ocean Literacy. The MBCP session on “The Significance of Marine Technology in Science Communication – Challenges and Opportunities” (21/04/09, Vienna) allowed fruitful discussions moderated by Heike Langenberg, Nature Geoscience Editor. Download report here. The MBCP session “Revealing the hidden map of Europe” (21/07/08, Barcelona) brought together professional science communicators across Europe to present how scientific findings from the deep are used to science communication efforts. The debate was moderated by Holger Wormer, Professor for Science Communication at Dortmund University and former science editor of Germany biggest daily newspaper Süddeutsche Zeitung Munich. Download press release here.